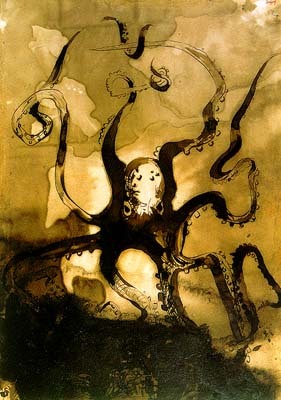 Recently when reading what Victor Hugo had to say about octopuses (none of it good)in Travailleurs de la Mer, I came across this line: “The octopus is a hypocrite. You don’t even notice it, and suddenly it unfolds itself.” For Hugo the octopus is murderous — it lies disguised in ambush, and then suddenly it opens up and gets you! (which indeed it often does, if you’re a fish). Elsewhere, Hugo writes of the sea itself “The wave is hypocritical: it kills, hides the evidence, plays dumb, and smiles“. To believe in the octopus, one must have seen it. Compared with it, the hydras of old are laughable. 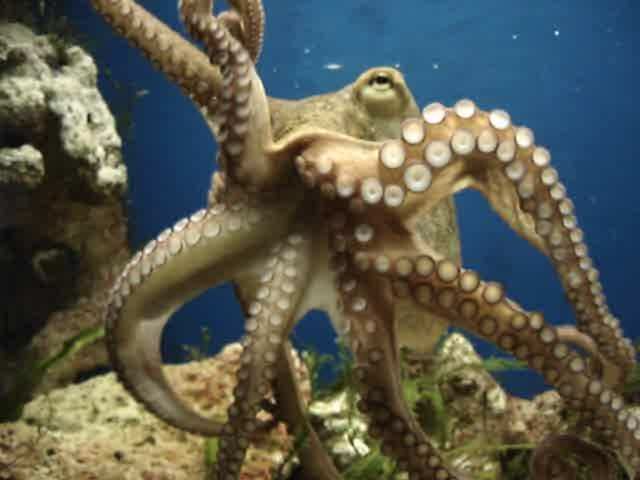 Orpheus, Homer, and Hesiod were only able to make the Chimaera; God made the octopus. When God wills it, he excels in the execrable. And all ideals being admitted, if terror be the object, the octopus is a masterpiece. Its most terrible quality is its softness. A glutinous mass possessed of a will — what more frightful? Glue filled with hatred. At night and in its breeding season, it is phosphorescent. This terror has its passions. It awaits the nuptial hour. 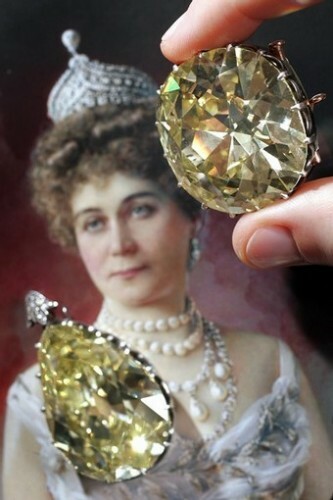 It adorns itself, it lights up, it illuminates itself; and from the summit of a rock one can see it beneath, in the shadowy depths, spread out in a pallid irradiation, — a spectre sun. It has no bones, it has no blood, it has no flesh. It is flabby. There is nothing in it. It is a skin. One can turn the eight tentacles wrong side out, like the fingers of a glove. The creature superimposes itself upon you by a thousand mouths; the hydra incorporates itself with the man; the man amalgamates himself with the hydra. You form but one. This dream is upon you. The tiger can only devour you; the octopus, oh horror! breathes you in. It draws you to it, and into it, and bound, ensnared, powerless, you slowly feel yourself emptied into that frightful pond, which is the monster itself. Beyond the terrible, being eaten alive, is the inexpressible, being drunk alive. Bourgeois doesn’t mean a citizen with the rights of the city. A duke may be bourgeois in the indirect sense in which the word has been used for the past thirty years or so. Bourgeois, in France, means roughly the same as philistine in Germany, and it means everyone, whatever his position, who is not initiated in the arts or doesn’t understand them. Once upon a time…. it was enough to be pink-cheeked and clean-shaven, with a square shirt-collar, and a stove-pipe hat, to be apostrophized with this injurious epithet. Before Marx were the bousingots. According to Pilbeam, the political factions of the 1830 revolution were not class-conscious, and to the extent that class lines can be detected between them, they did not match the distinctions described by Marx. She also concludes that the streetfighters who made this and later 19th century revolutions happen were never the beneficiaries of the revolutions. 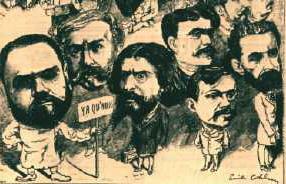 Gautier’s anti-bourgeois convictions were not political, and the political bousingots were not really progressive. The bourgeois and the bousingot are enemy twins, and, and you can’t have one without the other. The bousingots usually lose, and the cagy ones jump ship (as Gautier did). But the bourgeoisie always produces more of them. 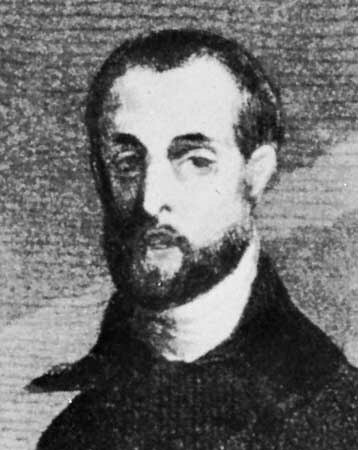 Gautier’s bouzingos (his spelling) were mostly just literary dissidents. The slightly later street-fighting bousingots were urban artisans and undifferentiated political rebels. Their enemy, the newly-discovered bourgeoisie, has pretty much dominated France ever since. We miss that in the United States, because what we go to France for is avant-gardists, not ordinary folk. 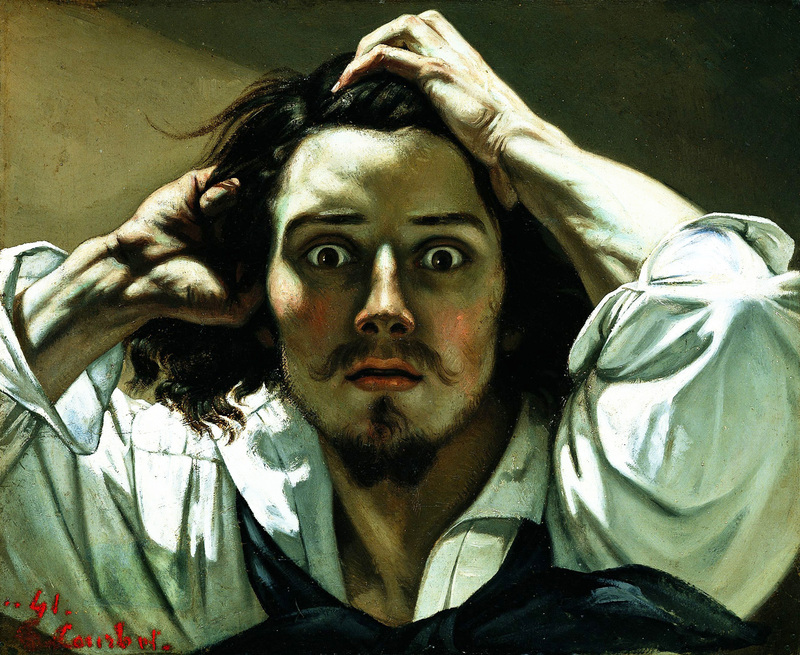 Two generations of American college students have learned that France is populated primarily by existentialists, surrealists, symbolists, Marxists, decadent aristocrats, bohemians, and so on — but no!. The petty bourgeoisie dominating France is the pettiest of them all. “Bousingot”: not in your dictionaries. 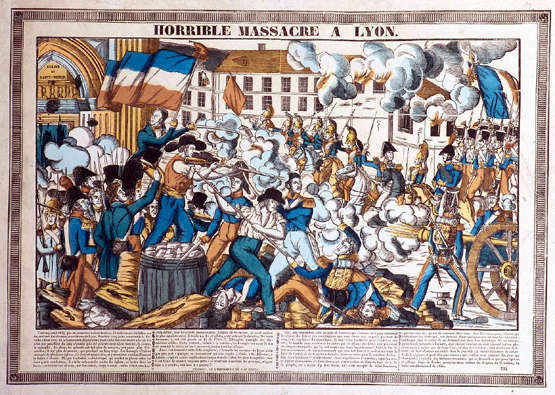 The massacre of April 9, 1834. The word bousingot, which designates certain French political and literary rebels during the period 1830-1835 (and which is seen twice in Hugo’s Les Misérables), was used as a political label only during that very brief period and cannot be found in my ten pounds of French dictionaries: as Hugo explains in his novel, it had replaced the word ” jacobin“, and a little later was itself replaced by the word “demagogue”. Luckily, ample materials exist on the internet for tracking down this word and its origins. The word comes from sailors’ and farmer’s argot and was adopted by Les Jeunes-France of the Petit Cénacle, a group of political and literary rebels of that era which included Théophile Gautier and Gérard de Nerval. Their enemies picked the word up to use against them, and the usage and the behavior it labeled both spread out into the greater society. Eventually it came to to designate more militant rebels (especially the students among them), and when these staged actual uprisings and brought heavy repression onto themselves, many of the original literary bousingots dropped the label. This use of the word survived as a historical reference to the rebels of that era, but the generic meaning “rebel” fell from use. The “original meaning” of bousingot, reminds you of cur in Flann O’Brien’s legendary Old Irish Dictionary. “Bousingot” means manure, filth, a stable, a snuffbox, a dive bar, a whorehouse, a racket or hubbub, or a sailor’s hat. Of these meanings, per Argoji, only the “racket” / “whorehouse” meanings seem to have survived into the later nineteenth century, still as argot or slang. Both in its base meaning and in its extended politico-cultural meaning the word “bousingot” is contested and aggressive, without a fixed referent and always looking for new victims. Conjecturally, the history of this never-respectable word goes as follows. To begin with, bousin meant stable or the floor of a stable, and the rare name Bousingot (attested only once in my google sample, in New France) is like the English name Stabler. (Nyrop gives many examples of this kind of -ot derivation.) 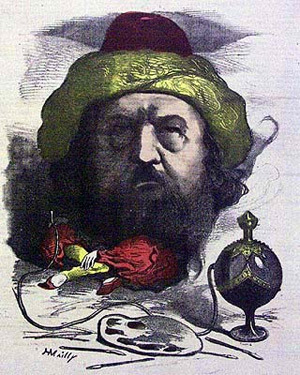 By analogy bousin came to mean a low and dirty dive bars and whorehouses, especially on the waterfront, and bousingot came to mean the rowdies (perhaps “muckers”) who frequented such places, their rowdiness, their hats, and even their nasty snuffboxes. Les Jeunes-France picked up the name in a jocular way, Gozlan made it famous with his satires, the word spread wider and was adopted or applied to political demonstrators and rioters (especially the students among them), at which time the les Jeunes-France backed off. (In its extended cultural / political meaning the word could be either an accusation or a defiant and jocular self-description — which as often as not would later be disavowed). And finally, the word reverted to its rowdy dive bar meaning. Altogether, an unstable and fluctuating word, but of a kind familiar in countercultural history, and a word whose career exemplifies the mutual dependency of counterculturalists and their bourgeois journalistic adversaries. (This page has basically been a Google exercise. I started with Dumont’s book, of which I’d only read part, and proceeded to track the bousingots down using Google and Google Book. I was able to replicate a fair proportion of Dumont’s research and find out some things he hadn’t included. It’s been very satisfying and I will never understand people who badmouth the internet.